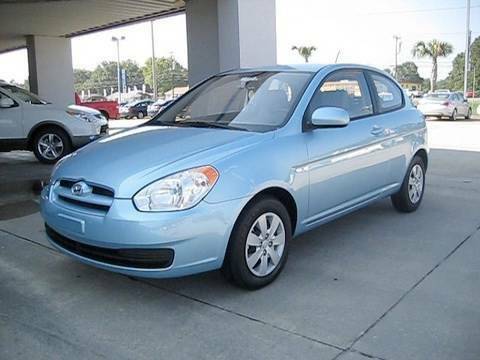 If an ultra-practical and affordable subcompact is your next vehicle purchase, you'll appreciate the 2010 Hyundai Accent's value, which includes numerous safety features, a long warranty and unusual availability of accessories. If your driving aspirations are bigger than your budget, you should also appreciate the SE three-door's sporty look, astonishingly responsive handling and cornering capability. Runs great and trouble free. This car was purchased in 2012 when it was already 2 years old, so it was purchased from a used car dealer. By then the "bugs" were pretty much non existent and I have had absolutely no trouble or problems with this car. I sure hope it runs the way it has been running for the next 20 years because it is actually problem free. My husband is a firm believer if you treat your car the way it should be treated and keep it service regularly it will keep running forever. And I guess he's right my last car was almost 20 years old and ran like a charm, I just thought it was time for a change and so very happy that I just happen to have chose this one. My Hyundai accent. Best car I have ever owned. This cute compact car is a dream come true. No problems with it. Oil changes are all I have done. The warranty is the best 10 yr. 100, 000 miles is the best I have found on any car. This accent has power steering, ac, has 6 airbags and is a 5 speed. Great on gas and comfortable cloth seats. I would recommend the accent blue to anyone.. But the bad part Hyundai has stopped making them. That is so sad because I would buy another one tomorrow. Despite being a smaller sized car it has extremely good trunk size. My Hyundai Accent hasn't been reliable at all. I have had it for less than 3 years and it has less than 150,000 miles but it has broken down in a way that makes it unable to drive at least 6 times since I bought it. Currently I would say something breaks on it every 3-4 months. It also has very little room to sit or to drive. Legroom is atrocious. Anyone over 6 feet tall shouldn't consider driving this. Hyundai Motor America (Hyundai) is recalling certain model year 2009-2011 Hyundai Accent vehicles manufactured March 1, 2009, to February 11, 2011. In the affected vehicles, the brake light switch may malfunction. A malfunctioning brake light switch may cause the brake lights to not illuminate when the brake pedal is depressed or may cause an inability to deactivate the cruise control by depressing the brake pedal. Additionally, a malfunctioning brake light switch may also prevent the shifter from being moved out of the PARK position. Failure to illuminate the brake lights during braking or the inability to disengage the cruise control could increase the risk of a crash. Hyundai will notify owners, and dealers will replace the brake switch, free of charge. The recall is expected to begin November 2, 2015. Owners may contact Hyundai's customer service at 1-855-671-3059 or by visiting www.HyundaiUSA.com/Campaign131. Hyundai's number for this recall is 131. This recall is an expansion of 13V-113.